Welcome to Married Life: PSF: Happy Halloween! happy PSF! I hope Halloween is fabulous! Did Cory grow up suddenly or what! I like the tradition of Halloween. Wish we could carve pumpkins too. Pristine would love it. oh cute! 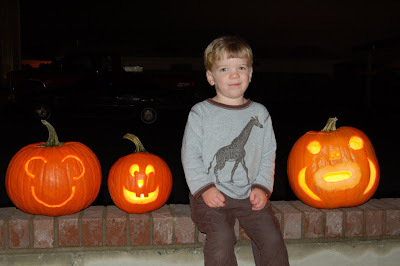 we carved ours last night too. I like the mickey mouse one. If you want to wander down my road I’m home. Not only did we NOT have snow we had a weird warm day.. go figure?? Cute pumpkins! I love the Mickey one! We are just lame-o here and do your basic jack!